Sophomore Meredith Keller, right, who will play Mary Poppins in Hayes High School’s production of “Mary Poppins,” rehearses the song “Supercalifragilistic” Tuesday. Keller said she was excited to learn the show and to be part of the theater community at Hayes. Senior Madeline Thompson, left, will play Jane Banks in the show. Cast members of “Mary Poppins” rehearse with Musical Director Dara Gillis, seated at piano, Tuesday after school to prepare for the show’s premiere in March. It’ll be a jolly holiday this March when students at Hayes High School perform “Mary Poppins” March 14-16. Students auditioned for parts last week and began rehearsing Monday after school. Meredith Keller, a sophomore, will be playing the practically-perfect-in-every-way nanny in the spring production, and she’s excited for the experience. Madeline Thompson, a senior, will be playing the role of Jane Banks, and she’s excited to play a character who gets to be in so many fun scenes. Thompson said she’s excited to work with Elijah Belcher, the sixth-grader who will play Michael Banks. “I’ve never had a brother before!” Thompson said. Belcher said he was honestly a little surprised to be such a big part of the musical since he only had small parts in the musicals at Dempsey. “I tried out not thinking I would make it,” Belcher said. Senior student Austin Hassel will play Thompson and Belcher’s father, George Banks. He’s excited to work with his co-stars. Bella Bosco, a senior, will be playing the role of Winifred Banks. She added the show is “bittersweet” for her. Bosco said the character of Winifred is under-developed in the film version, and she’s excited to do more with the character on stage. Thompson added she hopes people take away some inspiration from the production. Tickets for the production go on sale Feb. 6. 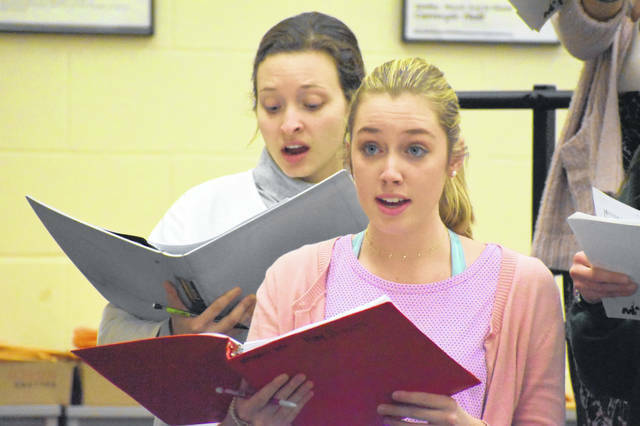 The performances will be at 7:30 p.m. on the evenings of March 14, 15 and 16.
https://www.delgazette.com/wp-content/uploads/sites/40/2019/01/web1_DSC_0275.jpgSophomore Meredith Keller, right, who will play Mary Poppins in Hayes High School’s production of “Mary Poppins,” rehearses the song “Supercalifragilistic” Tuesday. Keller said she was excited to learn the show and to be part of the theater community at Hayes. Senior Madeline Thompson, left, will play Jane Banks in the show. 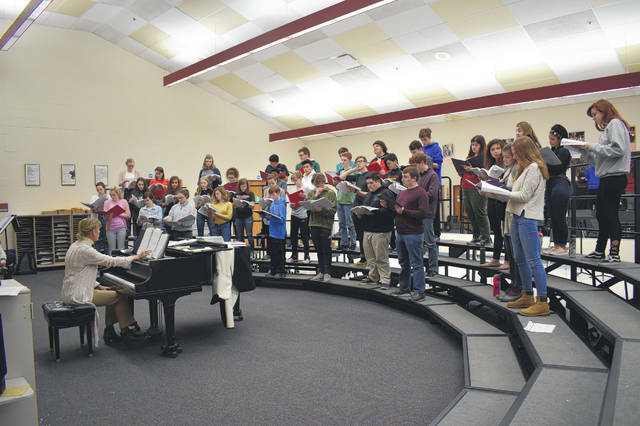 https://www.delgazette.com/wp-content/uploads/sites/40/2019/01/web1_DSC_0269.jpgCast members of “Mary Poppins” rehearse with Musical Director Dara Gillis, seated at piano, Tuesday after school to prepare for the show’s premiere in March.